Patented bucket and wringer design makes everything more hygienic. The bucket almost magically separates the mop and clean water from grit and dirty water. Dirt and grease particles are captured in a sludge trap - a filter located about 2/3 down in the bucket. The heavier particles are trapped in the lower 1/3 of the bucket so the sludge cannot be stirred up past the filter. 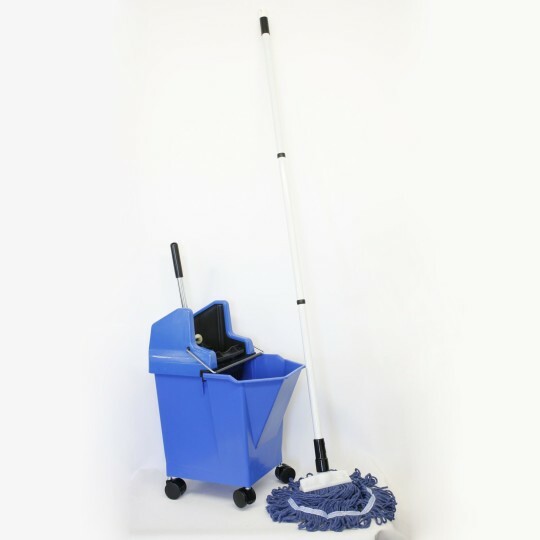 In this way, the mop can only reach the cleaner water at the top part of the bucket! The patented housing allows the long-handled wringer to rest on a slotted ledge within the bucket, not hung on the side wall of the bucket. When the wringer is in use, pressure is evenly distributed to all four caster housings. Ergonomic design creates less fatigue and injury. The bucket holds up to 4 gallons of liquid.